The sauna at Tartu maantee is located at cultural and historical Torupilli district. The name of Torupilli district comes from an old tavern that was once located on the cross road of Tartu road and Torupilli street. 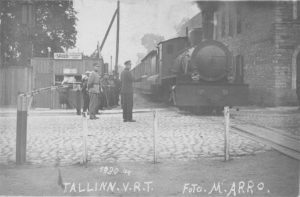 In the beginning of the 20th century this part of Tallinn was mainly uninhabited, and paddocks, vegetable and fruit gardens were spreading here. The beginning of Tartu road, closer to city centre, was build up already in the 13th century, however the wide and steady constructing works started in 18th and 19th century. It was the time when Peter the Great declared Tallinn to be the base of Russian military navy on the coast of Baltic Sea. The relocated officers and boatswains started to buy real estate here in Tallinn. The Torupilli district solid development was finalized by 1910. It was unique that at this time a narrow track railway went right throw this district exactly at the corner of Tartu road 73 (see the picture on the right). The building at Tartu road (or Tartu maantee) 73 is from 19th century. The construction of the building started from Türnpu street, where originally was a horse stable. Later a laundry, sauna and apartments were built. By 1882 the construction was finalized and with this a modern service building was established.